Please download the latest documentation which is updated as per the latest Jasper Version. The Latest source can be found here. 1. Download Jasper report server from following URL. 2 Execute the downloaded file. 3. 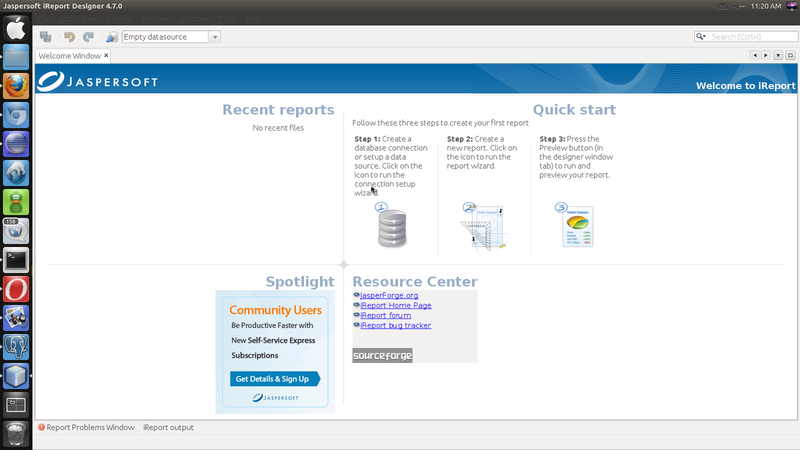 Press forward to install Jasper Report Server. 6. Select the Tomcat Configuration. 8. Press yes to Overwrite existing duplicate database. 9. Enter Tomcat configuration parameters. 10. Specify the dictionary where the psql, pg_restore and vacuumdb binaries are located. 11. Enter the port of your database. 15. After Log In Jasper Server will open. 17. After open iReport first of all we need to create database connection. 18. Select the data-source type. 21. Select New from File menu to create new report and select template. 22. Press highlighted button to write report query. 23. Write SQL query to get fields from data base. 24. If you want filtered report you can add parameter by clicking New parameter button.